Redshirt freshman LB Joe Tryon has a pick six to continue his strong spring. — First, an update on senior DT Greg Gaines. Last Wednesday, the senior defensive tackle sustained a minor knee injury in practice. Recall that Gaines was limited late in the 2017 season after sustaining a torn posterior cruciate ligament in his knee in late October. Now Gaines has been shut down for the remainder of spring, but I’m told this new injury is not expected to linger into fall camp come August. Some good news there. 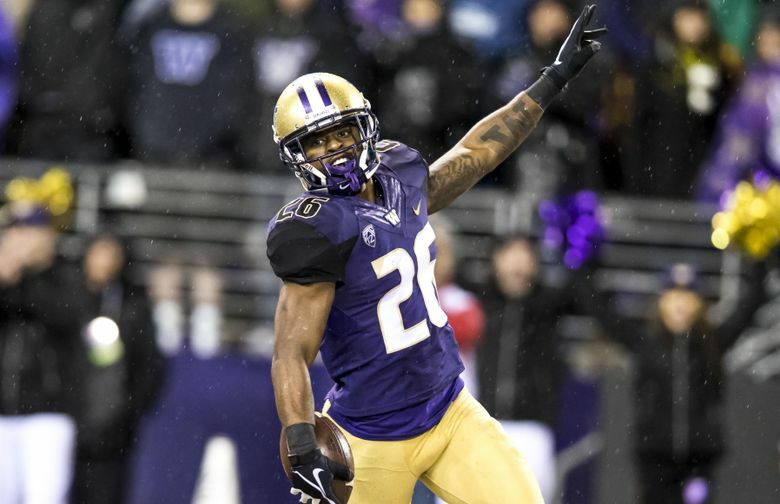 — The Huskies on Monday morning were in shells (helmets, shoulder pads, shorts) and spent the first half of practice indoors before going outside in the rain and wind for the second half of practice. — Redshirt freshman Joe Tryon, the No. 3 Buck linebacker, continued his solid spring with a leaping interception off a Jake Browning pass and returning it some 30 yards for a touchdown. Browning was throwing a screen pass toward the middle of the line of scrimmage; the 6-foot-5 Tryon read it perfectly and stepped in front of the pass. — Two plays later, Ryan Bowman and Ben Burr-Kirven combined on a touch sack of Browning. — The offense bounced back during a steady rain in the final 2-minute competition period. Browning scrambled right to a rush and found WR Aaron Fuller for a key first-down conversion. Two plays later, Browning threw an 18-yard touchdown pass to sophomore TE Hunter Bryant in the back right corner of the end zone. Bryant out-jumped CB Byron Murphy for the ball, and celebrated by spiking the ball in Murphy’s direction. — Sophomore RB Salvon Ahmed closed out practice with his best run of spring, a 30-yard run untouched in the end zone. That gave the offense the “win” for the day, and offensive teammates then swarmed Ahmed behind the end zone in celebration. — LB DJ Beavers (foot) and CB Austin Joyner (hamstring), out much of the spring, were limited participants Monday. Next: The Huskies practice again Wednesday (open to the media) and Friday (closed) before Saturday’s spring preview (open to the public) starting at noon.